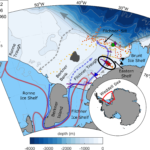 After we finished our mooring marathon at the western Getz ice shelf we started to make our way east towards the Amundsen polynya. 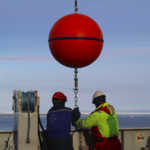 One stop on the way was the last UIB mooring that was placed in one of the smaller openings of the ice shelf. The area where the mooring was located had been covered in fast ice and heavy sea ice since we started monitoring sea ice conditions at the start of the cruise. When we got there the mooring position was located in open water about 100 meters from sea ice that was tightly packed by strong winds. After a bit of deliberation we decided not to release and recover the mooring, because we were worried that the strong winds and surface currents were going to carry it into the sea ice. 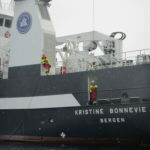 We did however talk to the acoustic release and worked out that the mooring was still where we had left it two years ago. 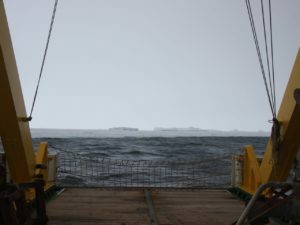 Gray, blustery waves and a heavy sea ice cover at the UIB3 mooring site. Then we turned further eastward to make use of a weather window that would allow us to complete some of the helicopter work that was on the schedule. 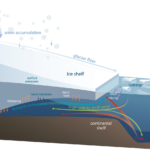 As well as a joint KOPRI/University of Bergen/University of Gothenburg effort to deploy autonomous phase-sensitive radars ApRES to measure ice shelf basal melt rates, there was also a group from the University of Texas who had installed radar to measure the ice sheet structure and magnetics equipment to find out about the type of ground under the ice on one of the helicopters. After being windy, snowy and cloudy for a few days the weather turned sunny, clear and calm on 22 January that also happened to be my birthday. 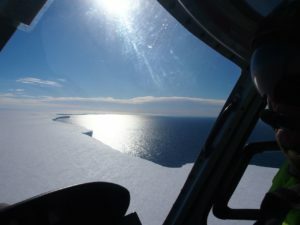 After a few delays we loaded our equipment into one of our helicopters, hopped in and away we went over the cliff of the ice shelf edge onto the white expanse of the eastern Getz ice shelf. 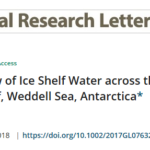 I have been involved in research around ice shelves for 20 years and two years ago I finally got to stand on one. 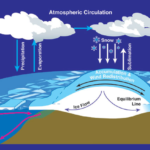 This time was just as exciting even though at the surface and ice shelf is just very flat and white and big. 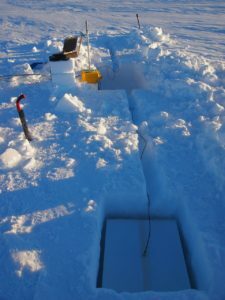 An ApRES site during the setup with a central snowhole to hold the actual instrument and battery and two holes for the antenna boxes to transmit and receive the radar signal. We spent a bit of time setting up our first ApRES site, while the helicopter shuttled out more equipment and fuel drums for the other helicopter to refuel while doing its radar and magnetics surveys. Then we loaded everything into the helicopter and moved to the second site where the setup went much faster, partly because we now had the pilot to help as well, partly because we had now worked out how to do things efficiently. After a photo session we took the scenic route back to the ship. 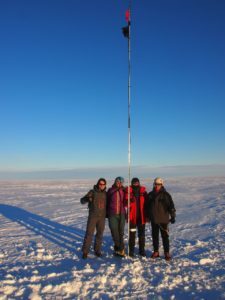 The ApRES team with the mast holding the Iridium and GPS antennas that is all that remains above the surface when the site has been deployed. Looking towards the western side of the bay at Getz East. 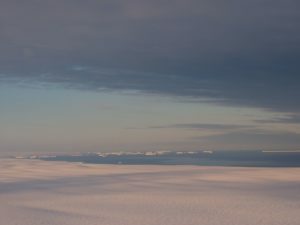 One of the icebergs in the distance probably damaged some instruments on one of the KOPRI moorings.